… and start discussing developmental biology. 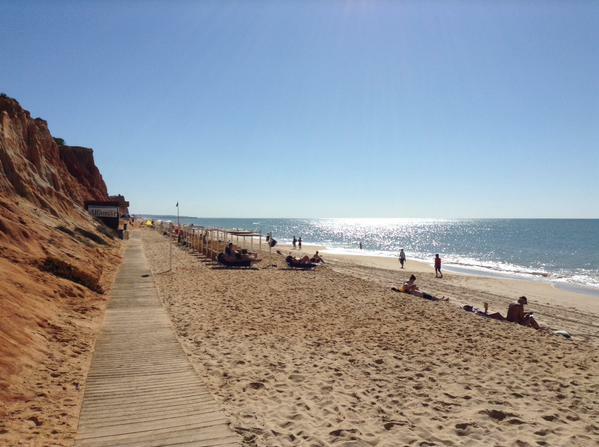 This may sound like the beginning of a joke, but in fact happened during the Joint Meeting of the Portuguese, Spanish and British Societies for Developmental Biology, which took place in Algarve, Portugal, in early October. The meeting venue, besides having the aforementioned bar, was also closely located to the beach, which we were able to enjoy thanks to a pleasant weather. Some of the participants also took advantage of the beautiful and family-friendly location to bring their own families. 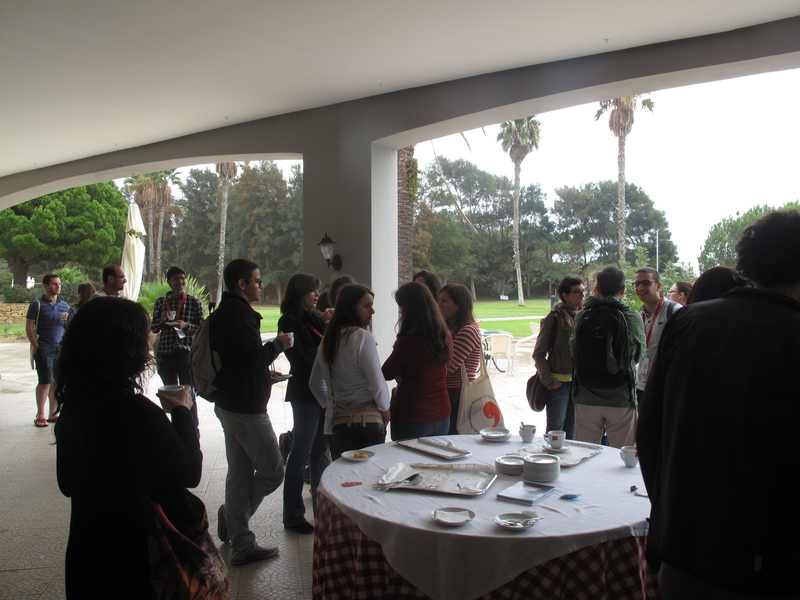 Nevertheless, the scientific talks and poster sessions still managed to draw the participants away from the seaside. A meeting by the sea. Photo by Catarina Vicente @the_node. The meeting started with early development, with a plenary lecture on the principles of pluripotency presented by Austin Smith. The lecture focused on the ongoing quest to establish human naïve embryonic stem cells in vitro independently of pluripotency transgenes, showing the progresses achieved so far and presenting the challenges that still need to be overcome. The transition from pluripotency to lineage commitment was explored by Sally Lowell, whose work identified some of the factors that prime cells for differentiation and revealed a role for adhesion molecules in the decision to differentiate. Berenika Plusa presented the advantages of using rabbit as an alternative model to study early mammalian development. Andrew Johnson showed that axolotl, an organism without extraembryonic tissues, can be used to study later roles of the pluripotency factor Nanog. The regulation of neuronal differentiation was also the focus of several talks. Kate Storey showed how differentiating neurons in the chick neural tube undergo apical abscission and revealed new evidence for the involvement of microtubule dynamics and adhesion molecules in this process. Also in the chick neural tube, Elisa Marti presented work on the role of Shh signalling in the decision to proliferate or differentiate and showed that the subcellular localisation of several Shh pathway components contributes for this decision. Anna Philpott also talked about division/differentiation in the nervous system and the regulation of proneural factor activity by phosphorylation in Xenopus. François Guillemot highlighted the role of the proneural factor Ascl1 in adult brain neurogenesis and how modulation of Ascl1 stability affects the balance between quiescence and differentiation. The talk by Alexandre Raposo was also on Ascl1 and its function promoting chromatin accessibility during neurogenesis. The link between adult neural stem cells and cancer was discussed by two drosophilists. Cláudia Barros is using a fly brain tumour model to identify new factors involved in tumour initiation, while Rita Sousa-Nunes is using this model to study the interaction between tumour cells and the microenvironment. Moving away from neural lineages, we also heard about regulation of proliferation, differentiation and cell movement of presomitic mesoderm progenitors from Leonor Saúde and single cell oscillators as components of the segmentation clock during somitogenesis from Andrew Oates. Later in development, the formation of the inner ear lumen in zebrafish was introduced by Berta Alsina, revealing that mitotic cell rounding and epithelial thinning regulate lumen expansion. Juan R. Martinez-Morales talked about optic cup morphogenesis in zebrafish, showing that both rim involution and basal constriction contribute to cup folding. Zebrafish embryos were also the stars in the beautiful movies shown by Claudia Linker, whose work combined live imaging with cell ablation to test the role of leader, follower and pre-migratory cells in the collective migration of neural crest cells. At the chromatin level, Ana Pombo proposed that the priming of developmental genes for future expression in embryonic stem cells involves the Polycomb complex, a specific modification of the RNA polymerase II and local transcript degradation. Rui Martinho showed how chromatin remodelling is involved in the transcriptional reactivation of the Drosophila oocyte during meiosis. Javier Lopez-Rios presented his work on a limb-specific enhancer responsible for the spatial differences in Ptch1 expression between mice and bovine, which underlies their distinct limb anatomy. The meeting ended with a plenary talk by Moisés Mallo, who presented his work on Gdf11 as the coordinator of the trunk to tail decision during vertebrate embryogenesis and revealed an unexpected role for a pluripotency gene in trunk specification. The meeting included many other exciting talks that have not been reported here. Overall, the meeting programme showcased the diversity of the developmental biology field in terms of subjects and model systems. The meeting also achieved a perfect gender balance among speakers – 17 female and 17 male speakers. Outside the lecture hall, scientific discussions continued throughout the free afternoons and outdoor poster sessions while enjoying the warm weather. And, of course, in the bar. As the meeting came to an end, the sunny weather turned into a rainy storm, which made the departure a little less sorrowful. Coffee break al fresco. Photo by SPBD.